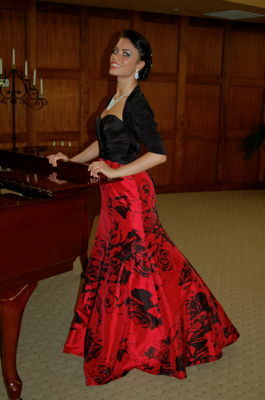 Since 2011 mezzo-soprano Ginger Costa-Jackson has sung the title role in twelve different productions of Bizet's Carmen. She will star in yet another this month for San Diego Opera. Then it's on to rehearsals for nine performances of Bizet's masterwork at Seattle Opera. Is the singer tiring of Carmen? Not even close. She loves the character's sense of freedom and empowerment, and works with each new director to make her performance even more convincing. Costa-Jackson was accepted into the Metropolitan Opera's Lindemann Young Artist Development Program at nineteen. Her musically inclined parents made musical training a high priority for her and her sisters Marina and Miriam, but they couldn't have anticipated how well that would turn out. Later this year Marina will play Mimi in Los Angeles Opera's La bohème, and Miriam, the youngest Costa-Jackson, will play Clorinda with Ginger in the title role in Seattle Opera's production of Rossini's Cinderella. While with the Lindemann program for three years, Ginger was often called on to cover for cast members, but never had to replace someone for a public performance. 'Mezzos don't cancel. Tenors cancel, sopranos cancel, but mezzos rarely do.' That's not necessarily because of temperament. 'When you're sick, your vocal chords become thicker, and they have to stretch like an elastic band for high notes. So even if mezzos have a little cold, they can still sing their range.' Sopranos with a cold, on the other hand, worry about cracking on the high notes because of the lost flexibility. Other exciting moments have followed. 'At Glimmerglass in my first Carmen, I was on stage dancing, castanets in hand in the first act, and the tenor says, "Bugles are sounding. I have to go". And I get into this mad rage. "Ah, I'm so stupid to think I could possibly be falling in love with you. Take your garbage! Here's your hat and your sword." Afterwards on stage I remember thinking of the thrill of it and how real it was. I wasn't just standing and singing. I've always been more interested in the acting part than the singing', she laughs, 'and that's what I loved. I feel like the singing is part of the acting.' It increases the emotional impact of the story. A less thrilling moment came in another performance of Carmen. Don José 'Throws me down'. (She sings his aria quickly and softly.) Her skirt had a single hook which broke as she fell against a chair. 'I spent the entire aria trying to get the skirt hooked. When he finishes his aria, he has his head on my shoulder, and I whisper in his ear, 'My skirt broke. My skirt.' And he's like, 'what? What?' So I had to spend the rest of the scene holding my skirt up as I sang.' (She stands to demonstrate.) Even opera has its Janet-Jackson moments. But the show must go on. Costa-Jackson married Navy-Doctor Spencer Burk six years ago, and they now live in Pensacola, Florida. With an occasional exception, such as a Carmen in Tokyo, he attends all her performances. This time he flew with her to San Diego and stayed long enough to visit Naval Air Station North Island where they bought some of the essentials for the rehearsal weeks. He'll return for the performance next weekend. Burk's support means a lot to her as she copes with a nearly continuous travel schedule. So does a close relationship with her sisters. Ginger is eleven months older than Marina and about two years older than Miriam. 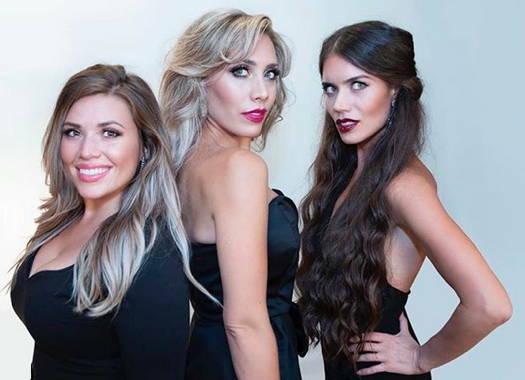 They all shared a room growing up, and the agent they also share knows the sisters enjoy traveling and singing together in pairs or as a trio. And they have, twice in Russia at major musical events and often in the United States. If Ginger has an audition that didn't go so well, other family members can sympathize, but when she calls a sister, 'There's a different level of understanding'. She knows it's happened to them too. Carmen co-stars tenor Robert Watson as Don José, soprano Sarah Tucker as Micaëla and baritone Scott Conner as Toreador Escamillo. The traditional grand production was originally designed for Lyric Opera of Kansas City. All four principle singers are new to San Diego Opera while conductor Yves Abel and stage director Kyle Lang are returning. Visit the San Diego Opera website for ticket information and this season's remaining schedule. Ron Bierman's interview with Ginger Costa-Jackson was first published on the website Broadway World.